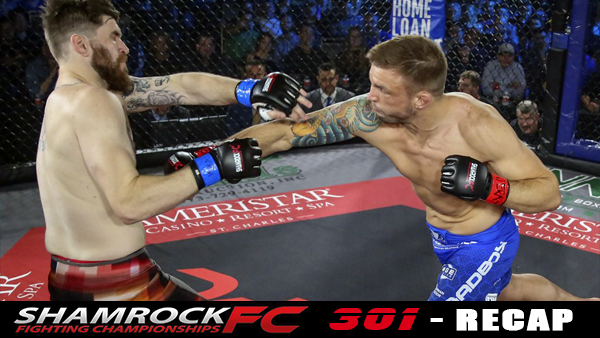 In the main event, Adam Cella made quick work of Coltin Cole with a first-round submission win. In their last match-up, neither fighter was satisfied with the results as Cole won by disqualification due to illegal elbows. As the fighters met in the center of the cage, the first punch of the night, a straight right from Cella, landed and knocked Cole to the ground. The fight went to the ground, and it appeared that Cole got the better of the initial grappling exchange, but the advantage was short lived. Cella scrambled to his feet, and Cole attempted to use pressure against the cage. In a quick turn of events, Cella locked in a standing guillotine choke. He cranked, and Cole tapped at 1:34 in the first round. The co-main event featured Adam Osmoe against Shaun Scott at welterweight. Scott looked stiff early but then connected with a flurry that opened a cut on Osmoe. But Osmoe went to work, getting the takedown and securing top position. Scott was successful getting the fight back to the feet. Osmoe shot for another takedown, and after a sloppy scramble, the fight was back standing but only for a second as Osmoe shot in, picked Scott up, and slammed him to the mat. In the second round, Scott took a hard right and another hard left on the chin. As Scott tried to hit back, Osmoe pushed the fight against the cage and worked for another takedown. Once he captured the leg, it led to another hard takedown, but Scott worked back to closed guard. "I was hitting him and he was walking at me," Osmoe said. "I'm like 'this guy is game'. I always revert back to my wrestling, it's my life line. I knew had to revert back to my roots and get the win that way." From his back, Scott pushed the action in this round by throwing punches, but the crowd started to get restless over the lull in the action. With two minutes remaining, Osmoe had Scott trapped against the cage, grinding out in the top position and staying out of danger. The momentum had shifted as Osmoe took control, fired some hard right hands, slid into half guard and then toward the back. Scott made a fantastic effort to reverse it and came out on top, but couldn't land any hard shots. Osmoe landed a big takedown to start the third. Working from a north-south position, he threatened a kimura. Osmoe moved to side control and used little punches to soften Scott. Scott was able to fight off many attacks but just couldn't avoid the pressure and ground attack from Osmoe. Scott made an excellent power escape when it seemed like he was just about done and took top position for a moment, but the fight ended as it was most of the match, with Osmoe on top and the winner by unanimous decision. "It's been about a year and four months," Osmoe said. "I felt great in there. Right in the first minute he rocked me, cut me open. I'm like 'ok I'm in a fight now,' it kind of woke me up. After he punched me in the face I realized I was in a fight." Middleweight Jordan Dowdy made quick work of Iowa's Eddie Larrea and got a badly needed win. The first round started with a big leg kick from Larrea, but the fight went to the ground. After a scramble, Jordan ended up on the back and Larrea did an excellent job defending the rear naked choke. Staying on the ground, Larrea searched for an ankle lock. Dowdy moved for a heel hook that slips out as he tried cranking. Dowdy, untangles the legs and moved to the top position. Larrea looked exhausted and disgusted that he missed his chance to land the toe hold. A nice transition to the back led to Dowdy firing punch after punch toward a defenseless Larrea who was face down, covering his head. The referee calls a stop to the action at 2:21 in round one, giving Dowdy the TKO win. Dowdy improves to 5-4. Bantamweight Dustin Lampros earned a first-round TKO victory over very late replacement Joe Taylor in Lampros' professional debut. Lampros threw a high kick and slipped to the ground and Taylor chased across the cage and worked for a takedown against the cage. But Lampros reversed position and eventually landed a couple of bombs as he stood over Taylor who was forced to roll to his stomach and tap the mat. Flyweight Corbin Howard made his pro debut a smooth one, earning a first-round submission over Zach Harvey. "It's exciting," Howard said. "I finished my amateur career undefeated, I'm keeping that alive. I'm starting back over at 1-0 so I'm kind of the small fish in the pond. That's exciting for me." Harvey rushed to the center of the cage throwing leg kicks, and Howard responded slinging some kicks of his own. Howard eventually landed with a nice sidekick into the abdomen. He then shot in for a successful takedown and moved to side control as Harvey tried holding on to a guillotine. Howard broke through and slid to mount and landed multiple punches before transitioning to an arm bar and getting the tap at 3:18 in the first round. Fans may have to wait a bit for his follow-up act, a full time student at Lindenwood University, Howard plans on a taking short break to focus on academics. "It's tough, I try and schedule my fights around around it," Howard said. "Fighting in January was good because I was coming off Christmas break. Although it's tough dieting through the holidays I'm pretty disciplined. I'm actually going to take the rest of the semester off from fighting and get back into it in the Summer." On the undercard, Joe Roye tapped Shane Schomidie 41 seconds into the first round with a triangle to get his first professional win. In amateur action, Even Elder submitted Luis Felipe in the first round at featherweight. Elder set up a nice takedown and landed in half guard. Felipe worked the lockdown to try and stop Elder from passing guard, but the top pressure was too much. Elder worked to pass and as he did his momentum forward allowed Felipe to work underneath and reverse position. Elder immediately locked on a triangle, and it was over, getting the fight stopped at 2:15. Oscar Ahuatzi won by decision over Ryan Dascenzo. Justin Lankford and Colin Parr had a scrap at lightweight. In the first round, the two were mixing it up with nice combinations and counterpunching. Lankford appeared to catch Parr with a right hand, and he pressed him against the cage. A takedown attempt by Lankford was stuffed. Parr then caught Lankford with a right hand that dropped Lankford. The fight looked close to being over but Lankford gutted it out as he scrambled up and back to his feet and the crowd erupted. "I knew he was going to be a tough guy," Parr said. "You can see that from all his fights. His technicality is where he lacks. I kept my boxing sharp, and when it went to the ground, I knew he had good top pressure, so I just tried to keep my guard closed. Technically, nobody can stay with me in this weight class." After another exchange, Parr again caught Lankford and dropped him. This time, Lankford took real punishment on the ground andthe referee had a close eye on the action. In the second round, Lankford caught Parr and forced him against the cage. As they worked to the center of the cage, there was a slip, and the fighters hit the floor briefly. Lankford and Par provided great action as they exchanged punches. Lankford appeared gassed and hurt, but he caught Parr again. On the ground, Parr tried working a rubber guard and moved back to closed guard as Lankford tried landing punches. The third opened with exchanges from tired fighters. They landed against the cage and Lankford shot for a takedown but got stuffed. Parr seized the moment and took control. He worked to the back and landed too many punches forcing the referee to step in and stopping the fight at 1:43 in round three. "I started off only doing jiu-jitsu, all I did for three or four years" Parr said. "Now, I've been working my boxing, kickboxing, Muay Thai, clench. It's all coming together and I feel I'm a dangerous person in this weight class." The lightweight Parr, out of Watson Martial Arts, improved to 8-1 and makes a strong claim as the area's top amateur, pound for pound. Freddy Kostjerevac won by unanimous decision over Arvin Mills. Jeff Rittenhouse won by verbal submission over Devin Roach, 14 seconds in round 1 by TKO injury. Rittenhouse checked a kick from Roach which seemingly broke Roach's leg. From the first punch, John Kelly exerted his dominance over Chris Wetherington. The fight hit the ground immediately, and Kelly moved to side control using a headlock ground and pound which forced Wetherington to tap at 1:36 in round one. Bryan Barkau started the evening with a bang. Barkau landed a crushing counter right on Matt Engelbart, the crack of his right hand heard across the venue. Barkau raised his hands in victory as Englebart crumpled to the canvas and the fight was called at 1:20 in the first round via KO. 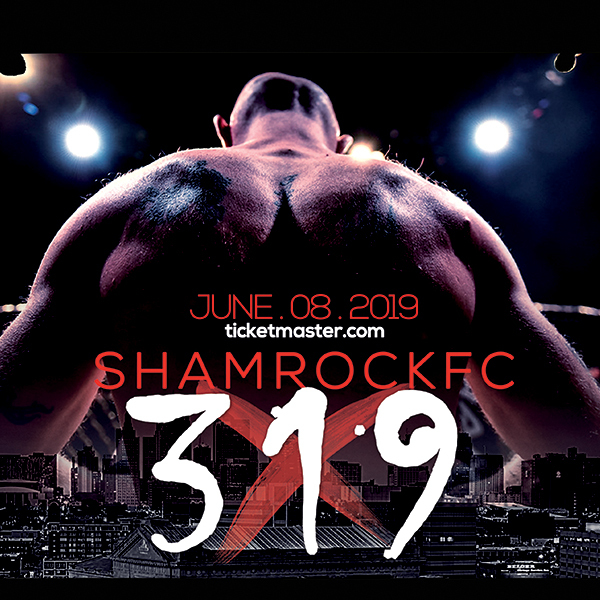 Shamrock FC returns to action on Saturday, February 3rd at the Ameristar Casino in Kansas City.